It was with disbelief that Super 8 afficianados across the globe read reports from last year’s CES in Las Vegas show that Kodak was showcasing, of all new technologies, a revamped Super 8 camera unlike anything the cinematic world has seen before. 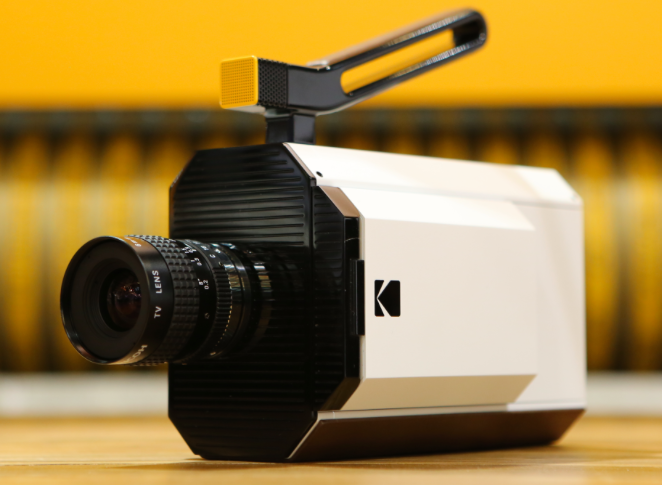 In order to commemorate the 50th anniversary of the Super 8 camera and Super 8mm film, Kodak has produced a new Super 8 camera that fuses the best of traditional Super 8 cinema with modern digital technology. The new Super 8 camera is desgined with a unique look by Swiss designer Yves Behar. Behar, a Swiss industrial designer, entrepreneur, and sustainability advocate, is the Founder of Fuseproject, an award-winning industrial design and brand Development. Behar is also the Chief Creative Officer of the wearable technology Company, Jawbone and Co-foudner of August a smart lock company. Behar has worked with companies such as Apple, General Electric, Herman Miller, Movado, Prada and Samsung. Although Kodak announced the camera last January at CES 2016, the camera is set to hit the market this Spring with no firm date set from the Rochester based company. Kodak has provided the press with some photos of the camera and some information on its features with plans to release a limited edition of the camera first with an expected price tag of around $2,000 and then Kodak will offer lower priced standard edition model to follow afterwards. Kodak has not provided any details to the press about what the differences in the two models will be nor has Kodak has provided the press with the specific “name” or model number yet for the camera. Kodak assures the media that this information is soon to follow. For nearly twenty years starting with the first Kodak Super 8mm camera sold in 1965, Super8 mm cameras and film stock were the only format available to consumers to record and project home movies. An article from the CES show for CNET on January 5, 2016 stated that ” in 1976, Kodak had 90 percent of the film market and 85 percent of the camera market, according to a Harvard Business School case study. But Kodak, once practically synonymous with cameras, filed for bankruptcy protection in 2012. The shift from film photography to digital photography changed everything for the company, and it hasn't recovered from its missteps.” According to article published in The Guardian newspaper on January 6, 2016 during the week long CES Expo, Kodak stated the company was bringing back the super 8 camera to capitalize on “…renewed interest in analog tech” and to make the legacy of Super 8mm film part of the current “…analog renaissance.” Before the reborn Super 8 camera has even hit store, big Hollywood names such as directors Steve Spielberg, Christopher Nolam, and J.J. Abrams have endorsed the product. Kodak’s new digital Super 8 camera will use a standard color or black and white silent Super 8 cartridge which, contrary to popular belief, the company has produced continuously since it was first introduced at the World’ Fair in 1965. The camera will feature an a LCD viewscreen allowing the filmmaker the seen what he or she is filming without having to squint through a viewfinder. Instead of soundtracks running parallel on the film stock, Kodak’s new Super 8mm model will feature a slot which will allow it to take and SD card to record sound. The filmmaker can then perform synch sound using film editing software. Filmmakers using the new Kodak camera can send the 50’ cartridge to Kodak for developing and for a $100 developing fee Kodak will mail back to the filmmaker the developed film on a reel as well post a scanned digital version of the 2.5 minute film in a password protected cloud file. Oddly enough, Kodak is not the first company to reintroduce Super 8 to the digital age. A father song team in Denmark have designed the Logmar S-8 . According to an article dated July 31, 2014 in WIRED magazine, “features on the Logmar include: rock steady stabilization, courtesy of a fixed pressure plate and precision milled registration pin; a camcorder-style, side-mounted swivel LCD display; C-mount threads for quick lens swaps; and programmable frame rates (16fps to 54 fps) and exposure times. Firmware updates are downloaded via a USB port. And, for armchair directors, there’s Wi-Fi remote-control capability; the Logmar generates its own hotspot and is compatible with Android, iOS, and Windows Phone.” The WIRED magazine article goes on to say : “ For spec junkies, the brain of this beauty is the ARM Cortex M3 CPU, the industry standard for microcontrollers. Even better, film is spooled by the NASA-approved Maxon D.C. motor, the same workhorse used in the Mars Rover.